In My Garden: Redbuds Mean Spring Time! Hello friends, more than any other sign of spring the blooming of the Red bud trees is it for me! Here in Indiana they are everywhere, and I love them so much! Even though when I was young I couldn't understand why they were called red bud instead of purple buds! The buds are red but the blooms are purple,pink and white. Here's everything you wanted to know about them but were afraid to ask(hehe). The Redbud tree is a relatively small tree with spreading branches and a small short trunk. Redbud trees bloom before the leaves appear which makes the flowers even more visible. The leaves are heart-shaped. The Redbud is a poplar ornamental tree, which can be found in many gardens and planted near sidewalks. The tree is one of the earliest flowering trees and is often used to add color to gardens. The purple/ pink flowers of the eastern Redbud appear all over the tree in early spring.Forms a spreading, graceful crown.The flowers are even produced on large trunks. There is nothing more gorgeous in the spring than the graceful branches of the redbud tree outlined in glowing magenta-pink flowers. The redbud is a small tree, suitable for even the most compact yards, providing spring color, summer shade and fall color too. The Eastern Redbud tree, Cercis canadensis, is native to the eastern Untied States and may also be seen blooming in the woodlands in the spring. 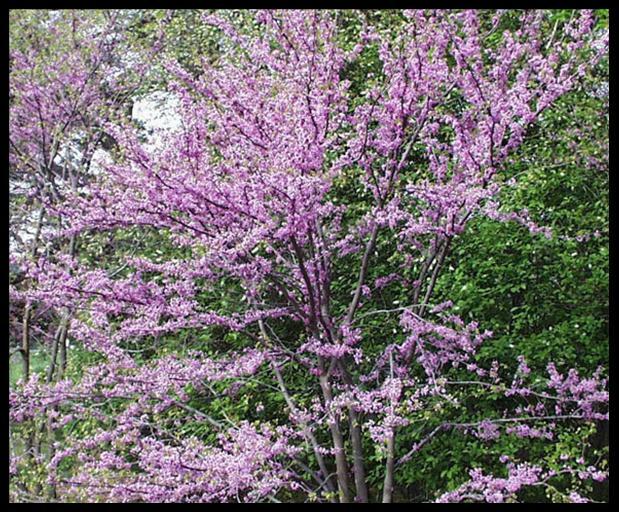 The temptation for homeowners who see a redbud in bloom is to buy a large tree so they can enjoy the blooms sooner in their own yard. But small, potted redbud trees are the easiest to establish and spring dormant planting is best. Trees grown from seed or cuttings of redbud trees growing in your area will adjust to your site more readily. Redbud trees form a taproot and resent transplanting, so choose the location where you plant your redbud carefully. A tree shelter or tube helps redbud trees adapt to their new home and protects them from hungry animals. Redbuds usually begin to bloom in their seventh year if conditions are to their liking. Redbuds can also be started from seed planted in the fall where they are to grow or in pots outside. 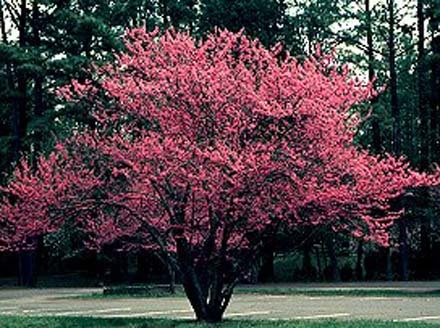 Although establishment may be slower than some other trees, and a little more care is required to get the redbud tree off to a good start, they are well worth the trouble. The redbud tree often begins growing as multiple stems from a small, short trunk. Trimming off all but one center stem will make the redbud look more like a tree and will avoid the problem of narrow crotches that split from winds or ice. 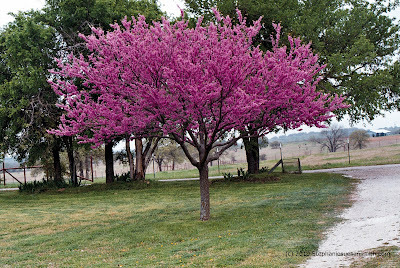 Other than early shaping of the tree and trimming off crossed or rubbing branches, the redbud will not need pruning. Canker and Verticillium Wilt are the most likely disease that your Redbud tree will get. Cankers begin as dark, sunken areas along the stems, and the area of limb beyond the canker will wilt and die. Canker areas should be pruned out; go at least one inch beyond the canker toward the trunk to make your cut and burn the pruned branch. Sterilize your pruning shears between each cut. Verticillium causes parts of the tree to suddenly wilt, or some branches may have leaves that turn yellow on the edges and then brown and die. There is no cure for Verticillium, but pruning off affected branch and fertilizing the tree may keep it alive for a few more years. Have the tree diagnosed by your county extension service before assuming it has Verticillium Wilt and removing it. Do not replant redbud trees where one has died from Verticillium Wilt as the disease remains in the soil for years. I'm all excited..got 2 pots ready for wild flowers seeds..hot dang.